Jewish Gold! This stuff makes everything taste good! or Gribenes" which we shall discuss at the end of this recipe. ● 1 - 2 pounds saved and frozen chicken fat scraps saved for this purpose. 1. Slightly thaw the saved chicken skins and cut them into 1½ inch pieces. 2. Place the skin pieces in a non-stick medium sauce pan and place the pan on medium low heat. 3. Cook the skins until the chicken fat has run out of them and the skins are a grey color. 4. Strain the contents of the pan through a cheesecloth lined strainer and collect the rendered fat or "schmaltz". for making the "Grieven or Gribenes". water,  and strain again through a coffee filter to achieve the golden almost fluorescent final schmaltz. 7. 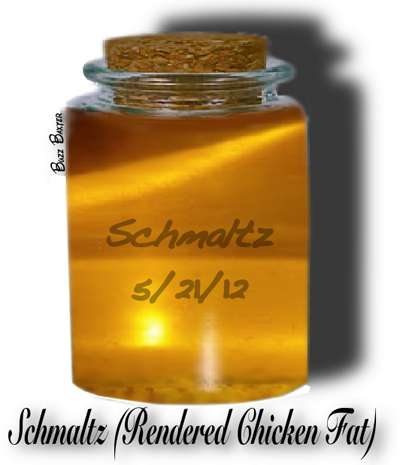 The schmaltz is now ready to be jarred and saved in the refrigerator. It will keep for weeks. ●  Reserved hardened fat from top of your chicken stock,  usually when making chicken soup. the top of your broth and place it in a small sauce pan. 2. With gentle heat,  begin to melt the hardened chicken fat. start a kitchen fire. Slow and gentle is the away to go here. your refrigerator for weeks. Use a wide mouth jar just large enough to hold your Schmaltz. only special occasions,  where a wonderful rich taste is desired. NOT YOUR EVERY DAY FAT!! NOTE: ALTHOUGH NOT THE EXACT RECIPE PRESENTED,  THE VIDEO(S) BELOW MIGHT BE OF HELP TO YOU.